Ms Judes Jalaja is an Assistant Professor of English, committed to the welfare of the students. Human Rights Education and Environmental Studies are the subjects she teaches other than English Literature. Having 20 years of teaching experience in teaching graduate and undergraduate students, she works for the holistic development of the student community. She has done research on Islamic women writers of the South Asian Region. She has also presented papers on Green Poetry. She is interested in Refugee writings too. 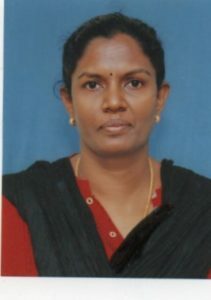 She is also the Vice-President of ELTAI (English Language Teachers Association of India) – Kanyakumari Chapter and the Faculty SPOC, Smart India Hackethon- 2019 (SIH), MHRD. She conducts Self Learning Classes for PG Students for NET/SET exams. She is a member of the Board of Studies and the Quiz club of the College. She has attended a number of seminars and workshops and presented papers too. Additionally she has organized seminars too. Currently she is doing research on the poems of Seamus Heaney and Alice Oswald with an Ecological perspective. She is also one of the EC Members of FSLE-India for its Tamil Nadu region.